Thank you for participating in the 2nd annual Tails & Ales Photo Contest! Winners will be determined based on the number of votes each photo receives during the voting period. We will celebrate the winners at Tails & Ales at Mitchell Park in Palo Alto on Saturday, October 13, 2018! The winners from each category; Dog, Cat, Rabbit or Pocket Pet will become our brand ambassadors for next year’s Tails & Ales contest and event. Their images will be rendered in graphic design and featured on 2019 Tails & Ales marketing materials! Congratulations to our 2018 ambassadors; Ruby, Topper and Kallie! First Place Overall Winner - GoPro Hero5 with Accessory Kit including 32GB memory card, tripod and more!! The first 3 people to raise $2,500 through their Photo Contest page will have their animal on our transport van for the next year! How could would it be to see your dog, cat, rabbit or pocket pet driving around the Bay Area, helping to rescue animals in need?! 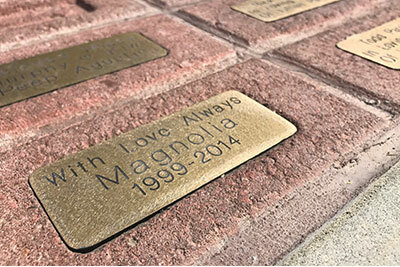 All contestants who raise $2,500+ will be able to customize a tribute brick and become a permanent part of HSSV with a unique and meaningful honor! You can personalize the text and even have symbols such as a heart or paw print! The top 10 contestants in each category will also be invited to an exclusive Paint Your Pet reception, co-hosted by HSSV and Bottle & Bottega. All contestants who achieve 200 votes or more for their photo entry will receive a Tails & Ales hat which can be picked up at the event on Saturday, October 13, 2018 at Mitchell Park in Palo Alto. Prizes are not transferable and may not be redeemed for cash.